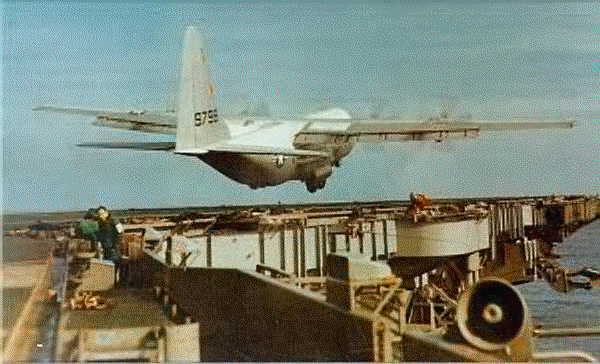 In November 1963 the C-130 Hercules made history by setting a record for the largest and heaviest airplane landing on a Navy aircraft carrier. The aircraft carrier was the USS Forrestal, a US Navy supercarrier named after former Secretary of the Navy James Forrestal. The Forrestal was launched on December 11th, 1954, and was the lead ship of her class of aircraft carriers. Earlier that year, the US Navy initiated a series of tests to determine if the C-130 Hercules, already a well proven transport aircraft, could serve as a Carrier Onboard Delivery aircraft or COD. The Navy initiated the tests due to the lack of a suitable aircraft that could resupply an aircraft carrier in mid ocean. The C-130 Hercules had already proven reliability, flexibility and versatility and combined with the Herc’s great range and payload seemed as the natural solution for the problem. Pilots Lt. James H. Flatley III and Lt. Cmdr. “Smokey” Stovall aided by Aviation Machinist’s Mate 1st Class Ed Brennan performed no less than 50 landings aboard the USS Forrestal. On the 8th, 21st and 22nd November 1963 a series of 21 full-stop landings and 29 touch-and-gos were carried out without an incident. The tests were conducted off the coast of Massachusetts in the North Atlantic. There were only a few alterations to the Hercules such as an added anti-skid system. On board the USS Forrestal, the deck cables were removed and a white line was painted on the axial deck to allow directional guidance to the pilot. The tests proved to be highly successful, with the Herc coming to a full stop in just 267 feet ( 81m) at 85,000 pounds. With a maximum load the C-130 Hercules used only 745 feet (227m) for take-off. The test revealed that the C-130 Hercules could lift 25,000 pounds (11t) of cargo and transport it 2,500 miles and land safely on the carrier. However, the idea was considered too risky for routine COD operations and as a result the C-2 Greyhound program was developed. The aircraft used in the tests was retired in May 2003 to the National Museum of Naval Aviation at NAS Pensacola, Florida. I was the conceiver of the ATCA, Advanced Tanker Cargo Aircraft. And I used carrier “Aircraft In Commission Rates” to justify a new ATCA, thereby doubling carrier effectiveness, range, distance, “in-commission-rates of carrier’s jet aircraft. we should bring the capability back to operational status. Great! Can I get a copy of this in my e-mail so I can successful challenge my airdale buddies! PLEASE NOT THAT C-130 Hercules WILL BE USED IN AFHGANISTAN. looks weird when browsing from my apple iphone. I’m trying to find a theme or plugin that might be able to resolve this issue. be shared around the web. Shame on Google foor now not positioning this submit upper!